Today at homify, we are going to bring you a project that is dedicated to all of those who dream of living in a luxurious home with all of the perks, but don't want to give up on the modern comforts that a big city can offer them. From the peaceful garden to the sheltered swimming pool, this modern and innovative home delivers on every single detail, creating an exceptional space for any family. Guedes Cruz Architects are the experts responsible for the phenomenal design. Founded in 2004 in Lisbon, this award-winning team have dedicated themselves to creating all types of projects that relate to urban architecture. Come with us and get to know this exquisite and brand new home! 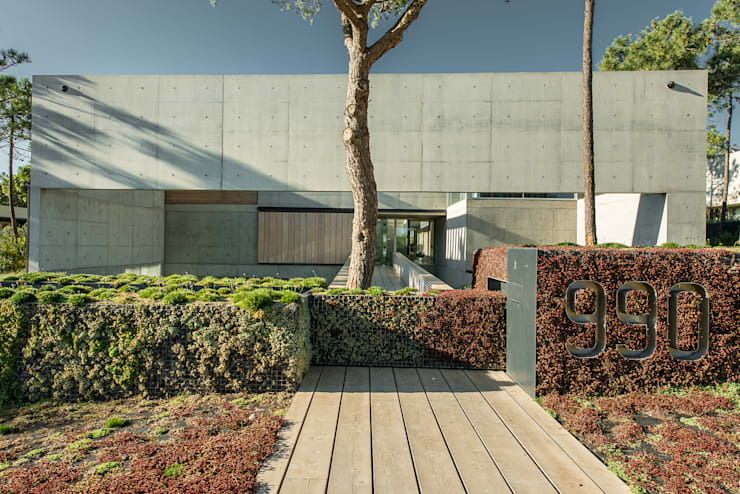 Situated about 30km from the Portuguese capital of Lisbon in the city of Cascais, this home features a number of unique elements. 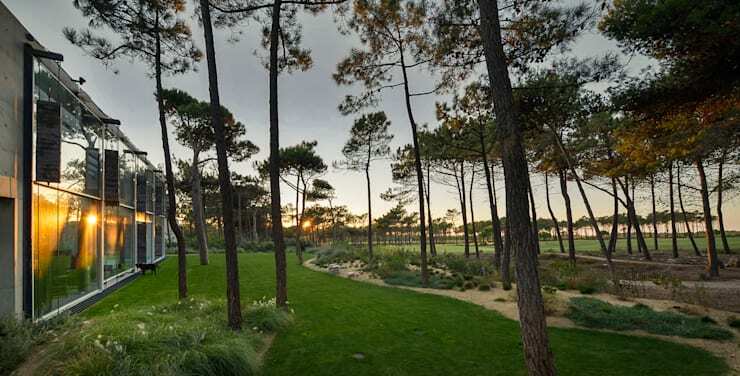 Apart from being so close to the capital city, this area is surrounded by a natural landscape that takes us away from the urban hustle and bustle. It also offers a beautiful climate, where you can get lost in the trees and the gorgeous environment, without being too cut off from the city. 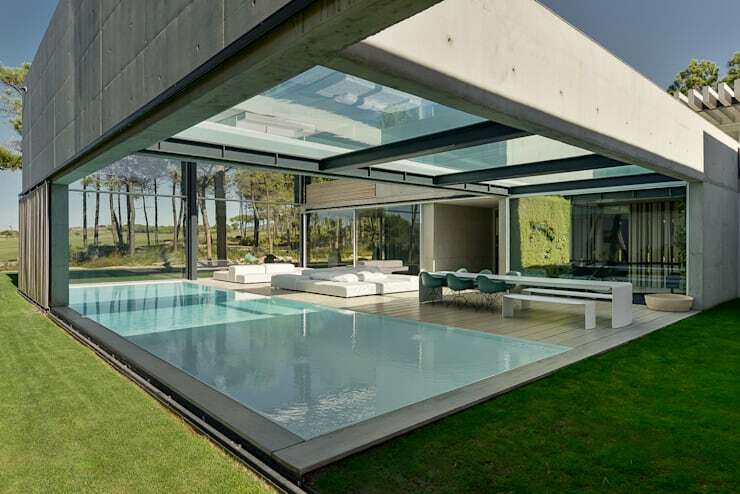 There are also panoramic views of the sea, thanks to the glass structure of the home. It wouldn't look out of place on Vancouver's North Shore or Summit Park in Montreal. From the beginning, this home reminds us a little of the Glass Lake House. 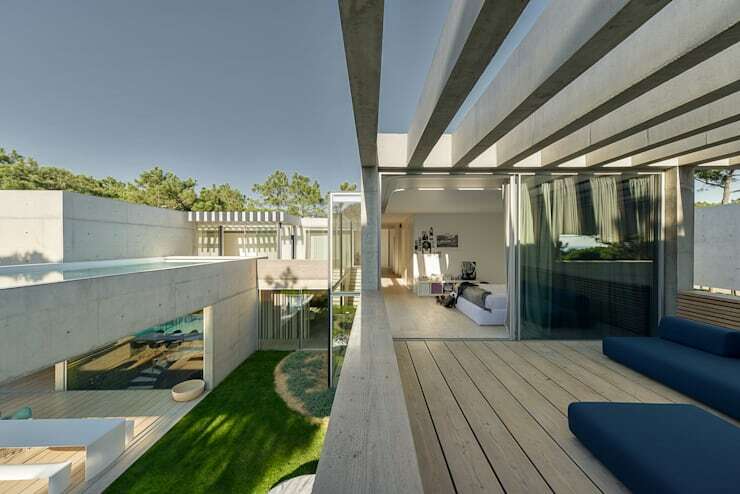 Nicknamed The Wall House by the architects, the structure is characterized by a large modern wall of reinforced concrete, which protects the house from strong winds in the region. 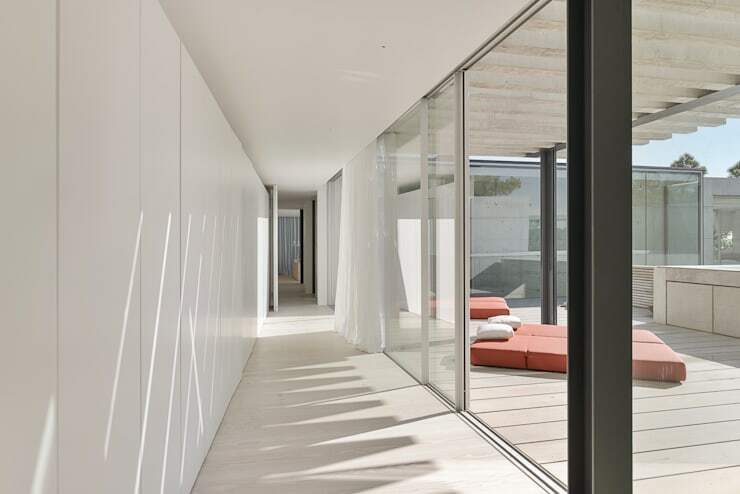 However, despite this large, concrete boundary, the two-storey house still opens up boldly onto the landscape, creating a symbiotic relationship between the interior and the exterior. Its monumental character, designed with geometric lines and expansive volumes, are balanced through a permanent awareness of human scale, which makes it a cozy corner . Like most housing projects that extend across two floors, the functional scheme of the home is separated between private and public spaces. The ground floor houses all of the social areas of the home such as the living room, dining room and kitchen. The areas that require more intimacy have been integrated on the top floor, creating a more sheltered and private atmosphere. The materials used in the construction of the building reflect the concept of creating a harmonious whole. 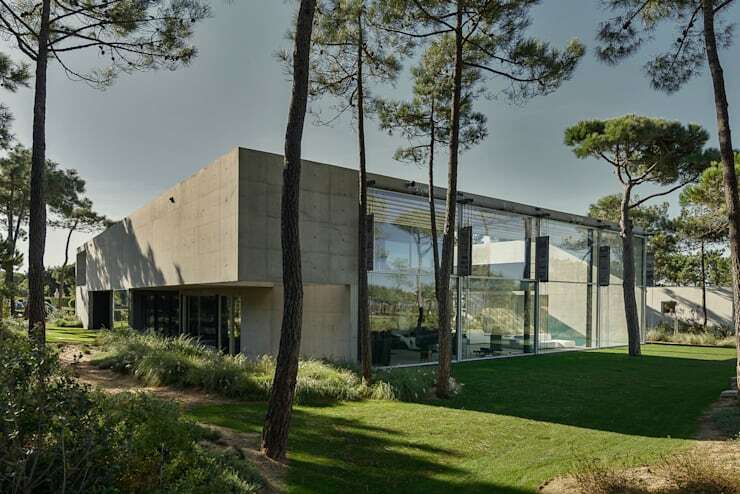 We can see how the hard, strong and chunky concrete is balanced out by the large planes of glass, which ensure constant permeability between the inside and the outside of the house. The home also works in perfect harmony with the trees, grass and plants that surround the home, blending in beautifully. The designers have not skipped a beat when it comes to the details of this home. Carefully designed, the two swimming pools in this home make this the house of the century. We can see a long swimming pool on the ground floor, which integrates with a cool and chic terrace. This is further enhanced by the edgy and modern terrace furniture, which offers a space for family and friends to dine or relax. On the upper level, we can see that there is a larger swimming pool, which leads off from the more private spaces of the house.The designers have ensured that the bottom of this pool is glass, allowing us to see up into it from the ground floor – a stunning visual effect! Although carefully designed in a contemporary style, the interior is still comfortable and functional. It is designed to be minimalist, enhancing the beauty of the exterior while creating a neat, clean and warm interior. The kitchen is undoubtedly one of our favorite rooms . The generous glass encasing not only provides natural light to this space but it also links the exterior with the interior flawlessly. The cabinets and the furniture are all finished in a white lacquer, multiplying that feeling of light and creating a very spacious looking environment. The kitchen island, in contrast, has a steel finish, breaking up the use of white so that it doesn't look too clinical. This creates that harmonious whole that we spoke of earlier. What's also important to note are the funky lamps, which have been recycled from Campbell soup cans. This adds a bit of a more relaxed and more homely touch to the space. Also have a look at these kitchen accessory must haves! 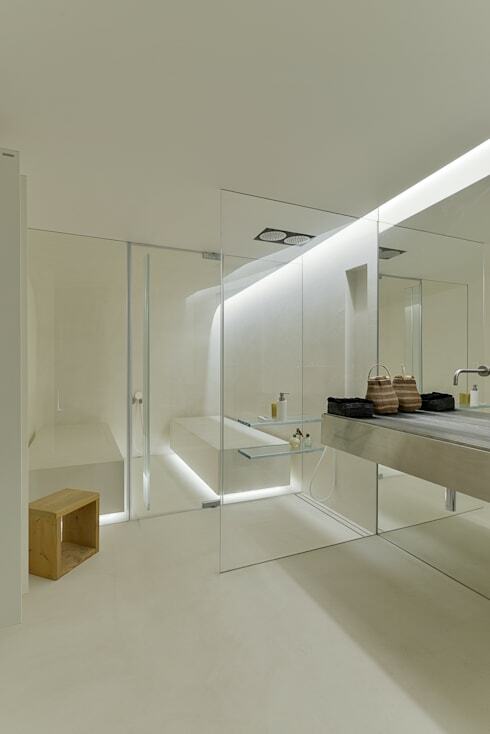 The simplicity achieved in the bathroom is a result of very careful attention to detail. The use of white in conjunction with the transparent glass brings sophistication and elegance to this environment. The bath area is divided from the rest of the room by a pane of glass, clearly defining the functions of the area. The shower and bath are also lit up from the base, creating a very peaceful ambiance as well as giving the impression that they are floating up in space! 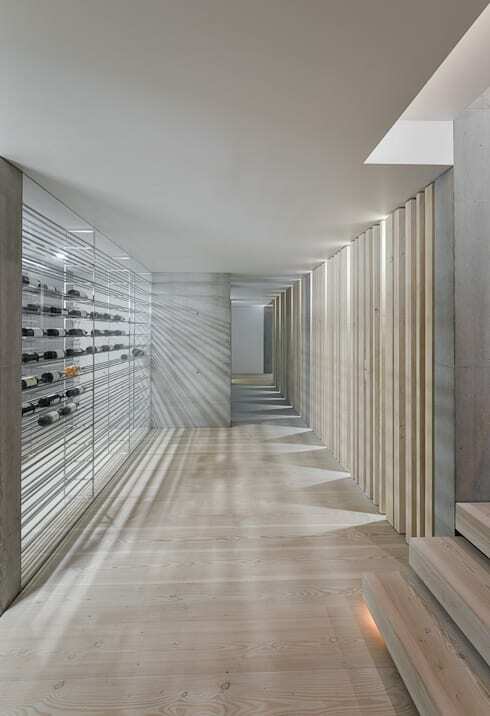 As the owners collect wine, the architects created a small private cellar for the house. 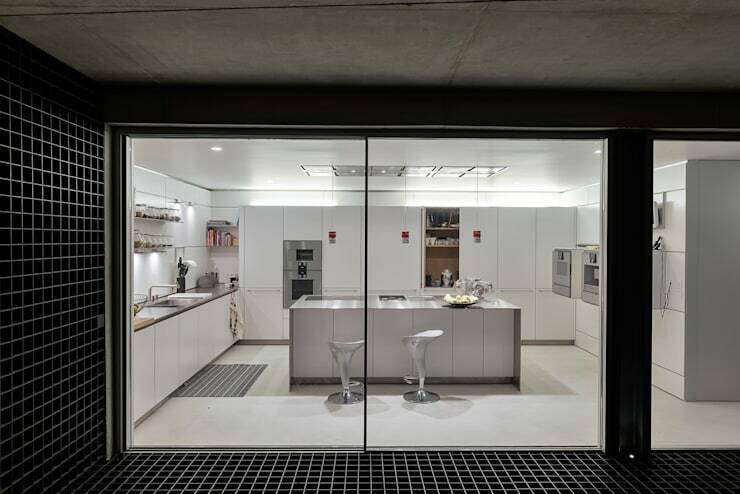 Built between two glass panes, the wine cellar consists of steel shelving designed in minimalist lines, which house the bottles. Don't you want one of these in your home? Much of the quality of the final project is due to the respect and the understanding of the surrounding landscape. The designers worked hard to preserve the natural wilderness, creating a home that would work in harmony with nature. The architectural design complements the environment, becoming a very elegant and sophisticated space thanks to its attention to detail. Would you like to live in this home? Comment your thoughts below!